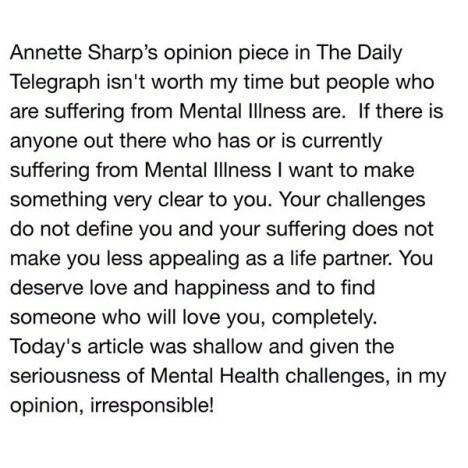 Daily Telegraph journalist Annette Sharp has been at the centre of a social media flurry after her article 13 reasons Jesinta and Buddy should postpone their summer wedding offered advice to AFL player Lance 'Buddy' Franklin who has recently taken time off due to mental health issues and his fiance, Jesinta Campbell. In her piece, Sharp wrote that,'Because Jesinta may still be absorbing the news that mental illness can be hereditary,' and 'Because Jesinta’s appeal and allure will halve when she marries as half the consumer market — men — rapidly lose interest in their dream girl when she is no longer single,' were reasons for the two to postpone their marriage. Sharp also commented on Franklin's mental health treatment. The Telegraph recieved much criticism for the piece on it's Facebook page, summarised here by mUmBRELLA. Fellow commentators and journalists quickly responded with their own pieces, for example Neil McMahon on ABC's The Drum. The Huffington Post reports that the couple are alledgedly seeking legal advice in regard to the piece and the Australian Press Council has also recieved complaints. Sharp's piece is a timely reminder that journalists and commentators should stick to what they know and get the facts before reporting on mental illness.